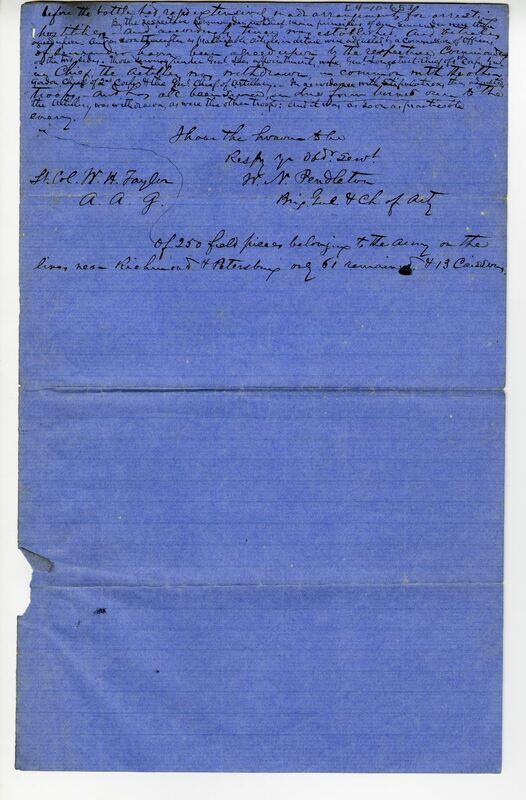 Item description: Three items from the day after the surrender at Appomattox Court House. The first is a paroled prisoner’s pass. Upon surrender, Confederate soldiers received paroles allowing them to return home without fear of arrest as long as they did not take up arms against the United States. 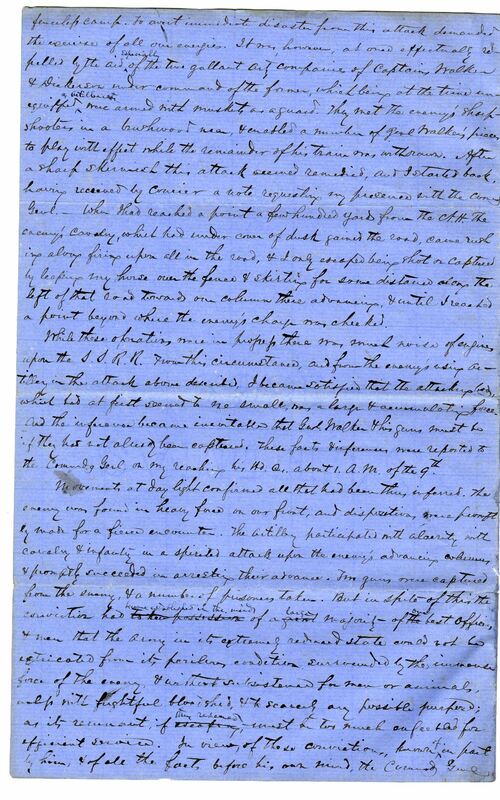 The second is a note from General Lee reporting on E. P. Alexander’s character and skill during his service for the confederate army. This item he planned to take with him to Brazil. 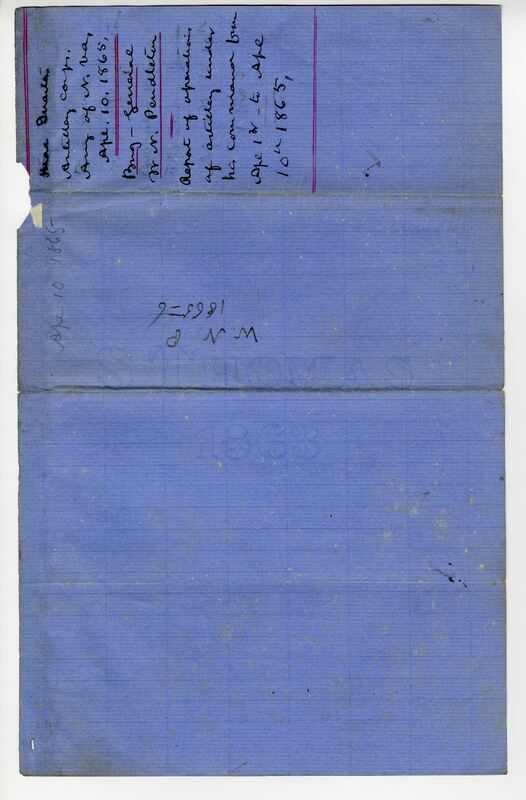 The last item is a report of operations of artillery under his command from April 1st to April 10th 1865. It details many of the events in Virginia that affected the artillery and eventually led to surrender. Item citation: From Folder 2, in the William D. Alexander Diary, #2478-z, Southern Historical Collection, The Wilson Library, University of North Carolina at Chapel Hill. THE BEARER W. D. Alexander Pres of Co. “C” 31 Regt. of N. C. Troop, a Paroled Prisoner of the Army of Norther Virginia, has permission to go to his home, and remain undisturbed. JN Bist Maj. Comdg Regt. Item Citation: From Folder 22a, in the Edward Porter Alexander Papers, #7, Southern Historical Collection, The Wilson Library, University of North Carolina at Chapel Hill. Brig. Genl. E. P. Alexander has served for the last few years with the Army of Northern Virginia, and has proved himself a skilful artillerist and brave and energetic officer. Being an educated military engineer, he has performed duties in that branch of the service as usefully as in that of the artillery. In morals, character and deportment he is unexceptionable. as in zeal, intelligence and attention to duty he is distinguished. Item Citation: From Folder 44, in the William Nelson Pendleton Papers, #1466, Southern Historical Collection, The Wilson Library, University of North Carolina at Chapel Hill. I have the honour to submit the following report of the operations of the artillery under my command from the 1st day of April to the present time. Much to my regret it has to be made without possible accep. 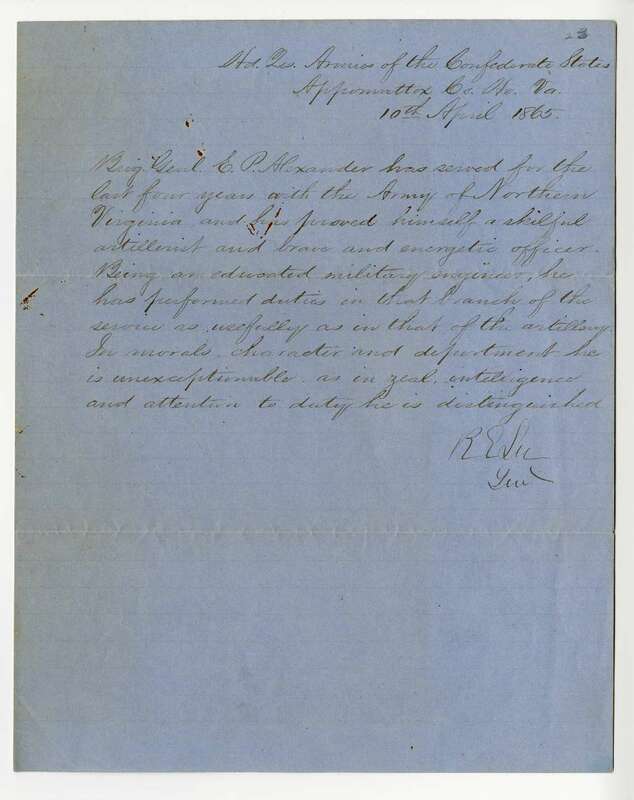 as will be seen from the circumstances of the case to special report from those superior offices of this important arm, A. L. Long, Chief of arty. 2nd Corps., Genl. E.P. Alexander. During the demonstrations of the enemy on the right of our lines near Petersburg on the morning of the 1st Apl. I ordered seven guns of Rogues’ Battalion, which had been held in reserve near Howletts to march to Petersburg, & on the night of the 1st by direction of the Comndg General, I ordered the remainder of the Battalion down; at the same time ordered the guns which had arrived during the day to proceed on the road towards the right, so as to be out of sight of the tower by dawn. Those guns were used with good effect – near Mr Farnbulls house (Genl Lee Hd Qrs) – on the morning of the 2nd when the enemy had unexpectedly massed a heavy force agains the opposite portion of our line – While these guns were well contesting the ground + holding the enemy in check. Lt. Col. Progue arrived with the remainder of his guns, + rendered admirable services in retarding the heavy advance of the enemy until such troops as remained could be withdrawn into the interior line. Three pieces with Maj. Brander were placed on the north side of the Appomattox so as to annoy the left flank of the enemy + prevent him from escaping. On the line, + to the right of the Cox road, were placed four pieces of the Horse Arty. under Str. Col. Chew + Maj. Breatted. The enemy had by this time, 12 o clock, fully established his line from Fort Gregg to the Appomattox river. In the fighting attendant upon these operation, various batteries of the 3rd Corps were caputred. The conduct of Officers + men were mostly of all praise; And that of the River, + supernumeraries of the artillery had been by Genl. Walker armed with muskets, deserves special mention. Those in Fort Gregg fought until literally crushed by numbers, + scarcely a man survived. In the meantime the firing on Col. Jones’ front, east of the city, had been severe. During the night of the 1st the fire from mortars + guns was incessant, + the men were very much exposed throughout the 2nd. I saw Col. Jones on the line about 3 o clock, + found his pieces so disposed as effectively to prevent any attempt of the enemy to improve the advantage already gained at the River Salient. I was at battery 45, during the day, + directed its guns against columns of the enemy moving down the valley towards the Weldon R. Road. The officers in charge of this part of the line deeming an attack imminent, I ordered two pieces of artillery to strengthen the position. In obedience to orders from the Commdg Genl. I ordered the withdrawal of all the guns at 8 o clock PM. This was accomplished with great sccess. 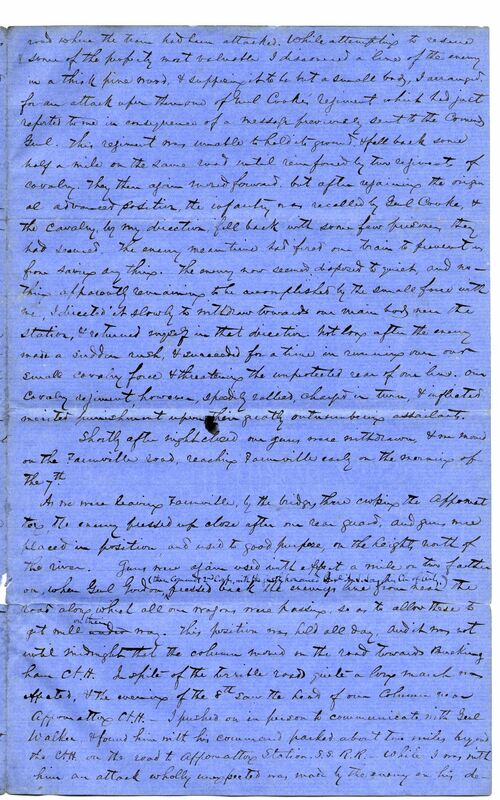 And although the difficulties in Col Jones’ lines were very great he succeeded in withdrawing all but about ten, which for the most part were not provided with horses + not intended to be removed. Several mortary were also brought off. Every piece that was abandoned was first debated. After making all necessary arrangements with regard to this movement, + seeing all the guns safely across the river, about 2 AM on the 3rd I moved on by the Hickory Road, marching all night. The march on the 3rd was fatiguing + very slow, on account of the immense number cassions with the army. At night I ? on the road side about 9 miles from Goodes bridge. I reached Amelia C.H. on the morning of the 4th + immediately proceeded to make arrangement for reducing the arty with the troops to a proportionate quantity. + properly to dispose of the surplus. These arrangements were at last affected. For the 5th Genl. Walker moved to the right, + west of the line of march of the Army, having in charge all the artillery not needed with the troops. Ninety five caissons, mostly loaded, which had saved in the winter been sent to the rear from Petersburg, were destroyed. Moving on past Amelia Springs by 10 o clock the next morning, 6th, we reached Rices’ Station on the S.S.R.R. Our troops here went into line, + I chose positions for guns commanding the Banksville road + sweeping the ground to its left. On this line there was heavy skirmishing during the evening, but no attack by the enemy. The enemy’s cavalry meanwhile having attacked our wagon train about two miles back on the road, I ahappening to be with the Commdg Genl when he received information to prevent any farther loss in that quarter. On the way I met a few wearied men of Harris’ brigade, + taking from them some twenty volunteers proceeded with them to the road where the train had been attacked. While attempting to reduce some of the property most valuable I discovered a line of the enemy in a thick pine road, + supposing it to be but a small brg, I arranged for an attack upon them and of Genl Cooke’s regiment which had just reported to me in consequences of a message previously sent to the commdg Genl. This regiment was unable to hold its ground. + fell back some half a mile on the same road until reinforced by two regiments of cavalry. They then again moved forward, but after regaing the original advanced position, the infantry was recalled by Genl. cooke, + the cavalry, by my direction fell backwith some few prisoners they had secured. The enemy meantime had fired on trains to prevent us from saving anything. The enemy now seemed disposed to quiet, and nothing apparently remaining to be accomplished by the small force with me, I directed it slowly to withdraw towards our main body near the station, + returned myself in that direction. Not long after the enemy made a sudden rush, + succeeded for a time in running down our small cavalry force + threatening the unprotected rear of our lines. OUr cavalry regiment, however, speedily rallied, charged in turn, + inflated merited punishment upon their greatly outnumbered assailants. Shortly after night closed our guns were withdrawn, + we moved on the Farmville road, reaching Farmville early on the morning of the 7th. As we were leaving Farmville, by the bridges there crossing the Appomattox, the enemy pressed up close after our rear guard, and guns were placed in position, and used to good purpose, on the heights north of the river. Guns were again used with effect a mile or two farther on, when Genl Gordon (then Commdg 2nd Corps, with the justly honored Genl A. L. Long by Ch. of arty. ), pressed back the enemy line from near the road along which all our wagons were passing, so as to allow these to get well on their way. This position was held all day. And it was not until midnight that the column worked on the road toward Buckingham C. H. IN spite of the terrible roads quite a long march was affected, + the enemies of the 8th saw the head of our column near Appomattox C.H.- I pushed on in person to communicate with Genl Walker, + found him with his command parked about two miles beyond the C.H. on the road to Appomattox Station. S.S.R.R. – while I was with him an attack wholly unexpected was made by the enemy on his defenceless camp. To avery immediate disaster from this attack demanded the exercise of all our enemies. it was, however, atonce effectivally repelled byt he aid especially of the two gallant Arty Companies of Captain Walker + Dickerson under command of the former, which being at the time unequipped as artillisty were armed with muskets as a guard. They met the enemy’s sharp shooters in a brushwood near, + enabled a number of Genl Walker’s pieces to play with effect while the remainder of his train was withdrawn. After a sharp skirmish this attack seemed remedied, and I started back, having received by courier a not requesting my presence with the Commdg Genl. when I had reached a point a few hundred yards from the C.H. the enemy’s cavalry, which had under cover of dusk gained the road, came rushing along firing upon all in the road, + I only escaped being shot or captured by leaping my horse over the fence + skirting for some distance along the left of that road towards our column these advancing, + until I reached a point beyond where the enemy’s charge was checked. While these operations were in progress there was several noises of aping upon the S.S. R.R. Twas this circumstances, and from the enemy’s using artillery in the attack above described, I became satisfied that the attacking brg, while had at first seemed to me small, was a large + accumulating force. An dthe inferences became inevitable that Genl. Walker + his gusn must be if they had not already been caputred. These fact + inferences were reported to the Commdg Genl. on my reaching his Hd. Qrs. About 1 AM of the 9th. Brig. Genl + Ch of Arty. 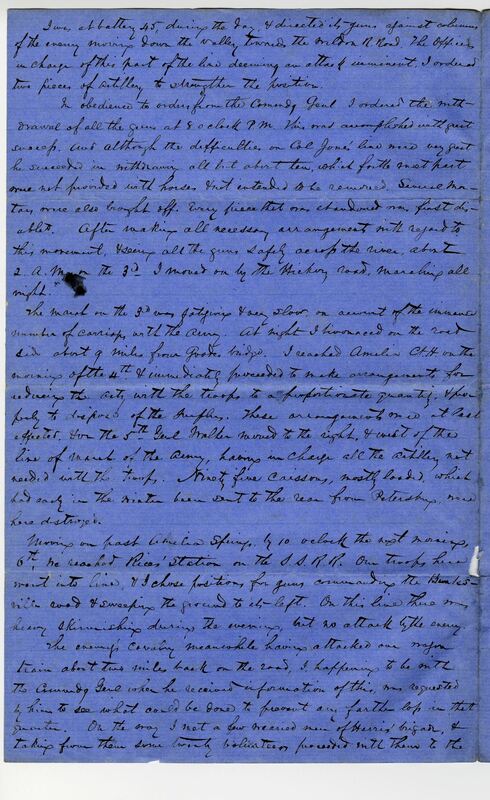 Report of operations of artillery under his command from Arl 1st to Apl 10th 1865. 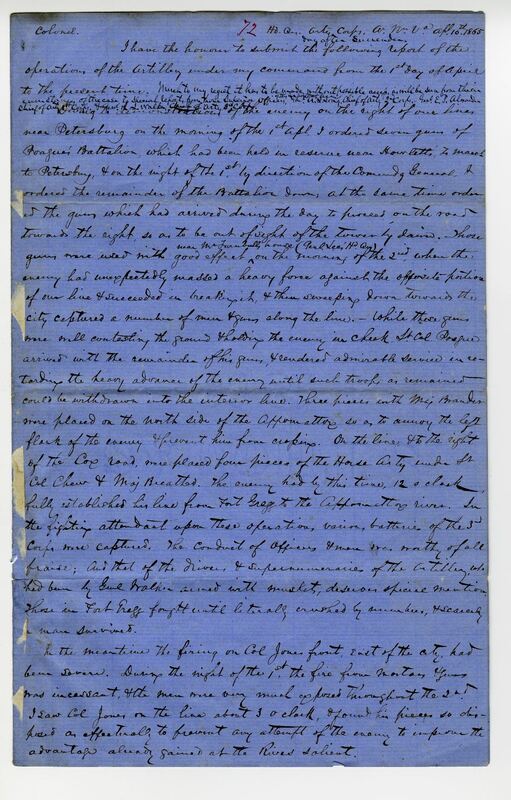 This entry was posted in Southern Historical Collection and tagged Appomattox, Appomattox Court House, artillery, Civil War, E.P. 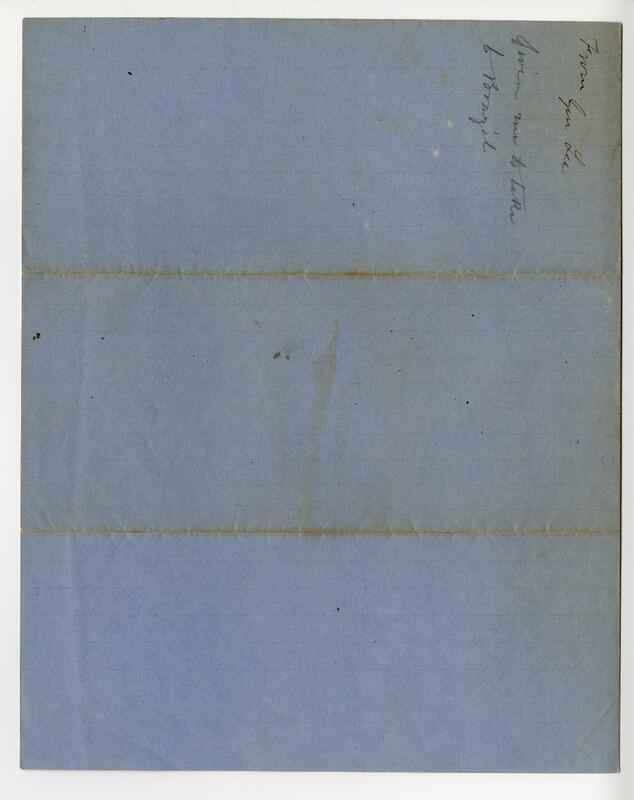 Alexander, Paroled Prisoner's Pass, Robert E. Lee, surrender, W.D. Alexander, W.N. Pendleton. Bookmark the permalink.